Mom, daughter, sister, aunt, grandma…it doesn’t really matter, most every female at one point or another seeks an undergarment that provides proper support during athletic activity or day to day living. SheFit has created an undergarment that changes with your body and gives custom support, no matter what size you may be. 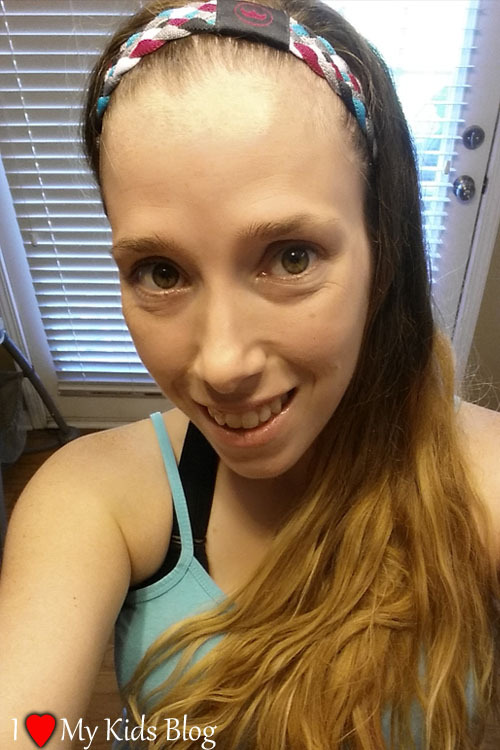 SheFit has provided me with a sports bra and no-slip headband so I could form an opinion and share it with you. Regardless of this arrangement, I was not required to give a positive review. All opinions expressed are my own honest thoughts. As a mom, who has had many changes within my body, proper athletic support is essential. I have put lots of money into sports bras. I have tried the cheap brands and the expensive ones, but have yet to find one specific company that offers the support I have been seeking with my ever changing body. As soon as I find one that works great, my body changes, either gaining or losing weight, which causes the sports bra to lose the athletic support that was once desired. I liked the SheFit Sports Bra because it gives me the ability to customize the support I need every time I wear it. It has completely adjustable straps that give you the ability to set your support level. I prefer to have as little bounce as possible, and SheFit Sports Bras do just that. From teaching a fitness class, playing with my kids, to working around the house, the support and comfort of this sports bra is great. The adjustable straps are secured with high quality Velcro that doesn’t budge. It gives you the ability to make a custom fit each and every time. As your body changes, it is easy to make the needed adjustments in support. I love knowing that as my weight changes, I won’t have to continue to buy different sizes of sports bras as often. When I first put the sports bra on, I secured the straps where the best fit was for me, then I removed it and lined up the Velcro part up just right. If you don’t take time to align the straps correctly you will get scratches and chaffing from the Velcro, but if you line it up correctly that problem is non-existent. 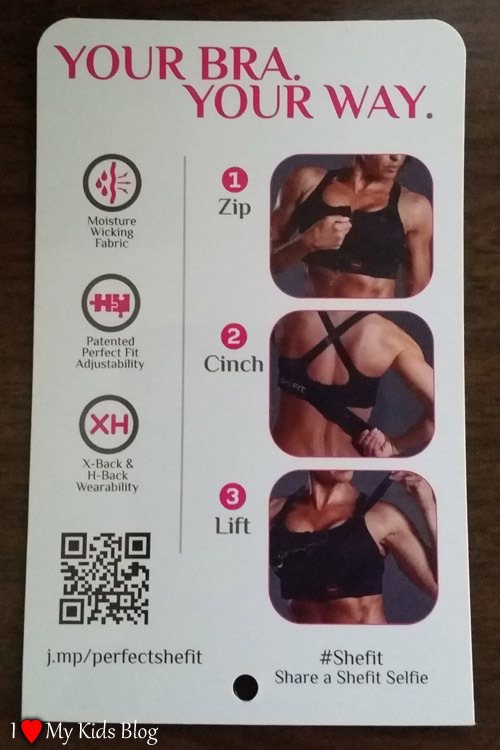 I received the SheFit sports bra in a Luxe size. According to the sizing chart on the website, I was just between needing a Luxe and a Medium. Knowing I had the ability to adjust as needed, I ordered the Luxe because I wasn’t quite ready to commit to the Medium. Now that I have been using this bra for a few weeks, I am glad I made that decision. The rib-cage strap is as tight as it can go, but I the bust size seems about right. I will need to order a smaller size soon, but for now, I am very satisfied. The only downside about the SheFit sports bra is the lack of elasticity in the fabric. If I am in the weight room or on the dance floor the support and feel of the fabric is great, however when I step up my workouts and increase the intensity, the workouts become more challenging because the sports bra is too supportive. 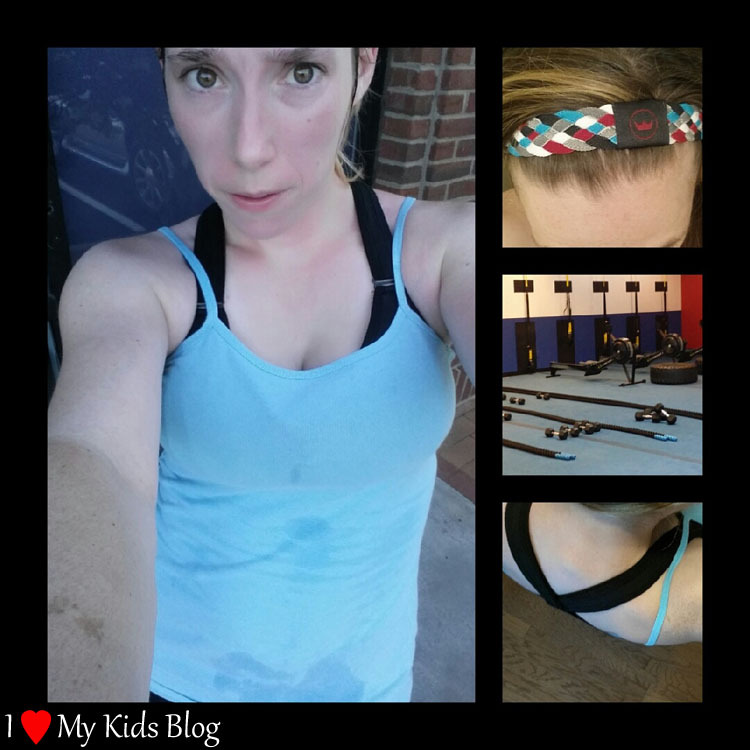 Burpees, sit-up, crunches, Russian twists, and other exercises of that nature were a little more challenging for me to do because the straps of the sports bra didn’t have much give to them. However I would take that problem over lack of support, any day! Had this sports bra been around when I was a teenager, I think I would have been able to overcome a lot of my self-conscious feelings while working out and being active. I would encourage you to try the SheFit Sports Bra out for yourself if you have been struggling to find the proper support during athletic activity or day to day living. I would also highly encourage this product for your teenagers as well. They will thank you for it. The no-slip headband is perfect for a day at the gym or an evening out. The design is cute and the quality is good. What struggles have you encountered when it comes to finding proper support during athletic activity of day to day living? What feature of the SheFit Sports Bra do you like best?